Jimmy Cornell will be at Boot Düsseldorf 2018 on the Blue Yachting - Garcia Yachting stand (Halle 16D42) throughout the show. "Erfolg und Misserfolg einer Reise. Was ist wirklich wichtig? " "Climate change and its effects on voyage planning"
"Highlights of a sailing life 1974 - 2017"
Le séminaire Grande Croisière vous propose de réfléchir sereinement à votre projet de grand voyage. 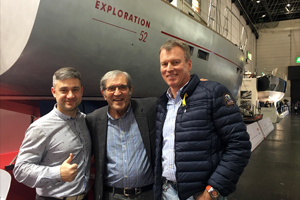 Avec des personnalités de la voile sous la houlette de Jimmy Cornell , avec des experts et des familles ayant effectué des voyages sous différentes latitudes et sur différents types de bateaux. Ce séminaire de 2 jours vous donne l’occasion de stimuler vos projets de grande croisière et d’échanger avec d’autres candidats au voyage. Jimmy will be at the authors' corner in the Marina Tent for the entire duration of the show to sell and dedicate his latest books. Jimmy Cornell will be on the Cornell Sailing stand (FV02 on the main stage in the floating village), where his latest books, Cornells’ Ocean Atlas, and 200,000 miles: A Life of Adventure, will be for sale. Highlights of my voyages to Antarctica and the Northwest Passage. Practical aspects and preparations for high-latitude sailing. Sailing west from the Shetlands to Iceland, Greenland, Newfoundland ... and the return voyage home. Seminar: Highlights of a sailing life with an overview of the consequences of climate change on blue water sailing. Climate change is having a visible effect on weather conditions around the world and this, more than anything else, affects sailors planning a long voyage. In his presentation Jimmy Cornell will discuss the major changes that have occurred in recent years and advise sailors how still to plan a safe voyage. The Suffolk Section of the Cruising Association (CA) is delighted to welcome back cruising guru Jimmy Cornell to the Royal Harwich Yacht Club in Woolverstone, near Ipswich, on Saturday 3rd November. 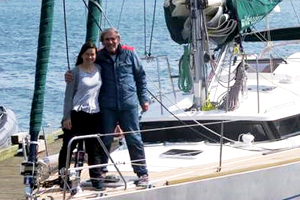 In a jointly hosted one-day seminar, the packed itinerary will also introduce Jimmy's daughter Doina Cornell who is sharing her family cruising experiences with the attendees. 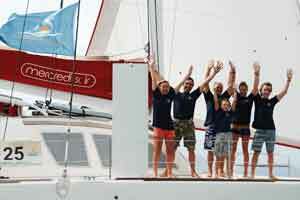 Jimmy Cornell returns to Lanzarote for a new cruising seminar series, taking place in Marina Lanzarote. 16:00: After the Caribbean – what next? Return to Europe directly or via Azores? Continue to USA and cross the Atlantic from there? Sail west to the Panama Canal and beyond? Comments on where to spend the coming hurricane season. 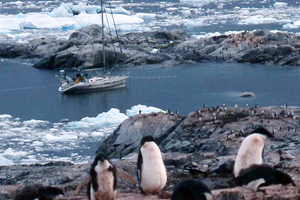 18:00: Climate change and its effects on voyage planning. What can be done to continue enjoying safe cruising. 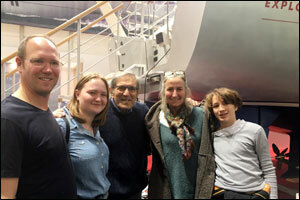 Jimmy Cornell can be contacted on the Garcia Yachting stand (Hall 1, G41). He will have his latest two books for sale: Cornell Atlas des Océans (the French edition of Cornells' Ocean Atlas) and the English edition of 200 000 Miles - A Life of Adventure. Jimmy Cornell peut être contacté sur le stand de Garcia Yachting (Hall 1, G41). Ses deux derniers livres seront en vente : Cornell Atlas des Océans (l'édition française de Cornells 'Ocean Atlas) et l'édition anglaise de 200 000 Miles - A Life of Adventure.